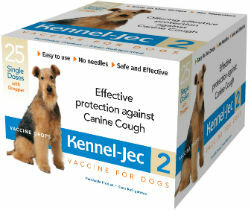 For vaccination of healthy, susceptible dogs and puppies as young as 3 weeks of age as an aid in the reduction of Canine Upper Respiratory Infection (Kennel Cough). Field studies support the safety of Kennel-Jec 2 when administered to puppies as young as 3 weeks of age. Easy to use and one dose with dropper. No needles. Safe and effective. Remove the metal seal and rubber stopper from each vial. Using the enclosed dropper, rehydrate the lyophilized vaccine with the accompanying one mL of liquid diluent. Shake until dissolved. Immediately withdraw the rehydrated vaccine into the dropper. Administer entire dose intranasally. Do not vaccinate puppies under 3 weeks of age. Puppies vaccinated between 3-6 weeks of age should be revaccinated at 6 weeks. Annual revaccinationis recommended. For intranasal use in dogs only. This vaccine is NOT to be injected. A very small percentage of dogs may show sneezing, coughing or nasal discharge for 3-10 days following vaccination. While these are usually temporary symptoms, anti-bacterial therapy may be indicated. Anaphylactoid reactions may occur.